Are you looking to finance or lease a laser machine? Non-medical lasers show up on the "restricted list" for probably 80% of equipment financing sources. Why is it Hard for Non-Medical Companies to Lease a Laser Machine? Non-medical means lasers that are used for aesthetic purposes, such as removing tattoos, unwanted hair, or cellulite. It's easier for a medical practice to finance equipment than for a non-medical practice. In reasonable situations, however, if you choose a financing or leasing company that has the right banking (or non-banking) connections, you can get your equipment funding relatively easily. Reasonable means there has to be some business case to be made for leasing to you. Finance companies often get inquiries from folks just starting a business with zero assets, no money, and poor credit. While it would be great to help everyone, it's only possible to help if some sort of strength is found to justify someone doing the deal. What are Laser Lease Rates? A few considerations are important when you look into financing or leasing a medical laser machine. The first is your strength as a borrower. If you have good credit and your business is established, you'll be considered lower risk. If you are just starting your business, or have some credit or cash flow issues, you'll be considered higher risk. Laser equipment leasing companies have several ways in which they can structure your contract. FMV leases are the least expensive in terms of monthly payments. Here's a breakdown of monthly payments over five years on a $50,000 laser based on risk profiles. They can also be higher for very rough situations. It really depends on how risky the proposition is. Which is the Better Way to Lease a Laser? FMV Vs. $1 Buyout Vs. 10% Buyout? We find that there is no "best way" to lease - you should decide based on your own situation which structure works the best for you. However, one very important consideration is tax advantages. 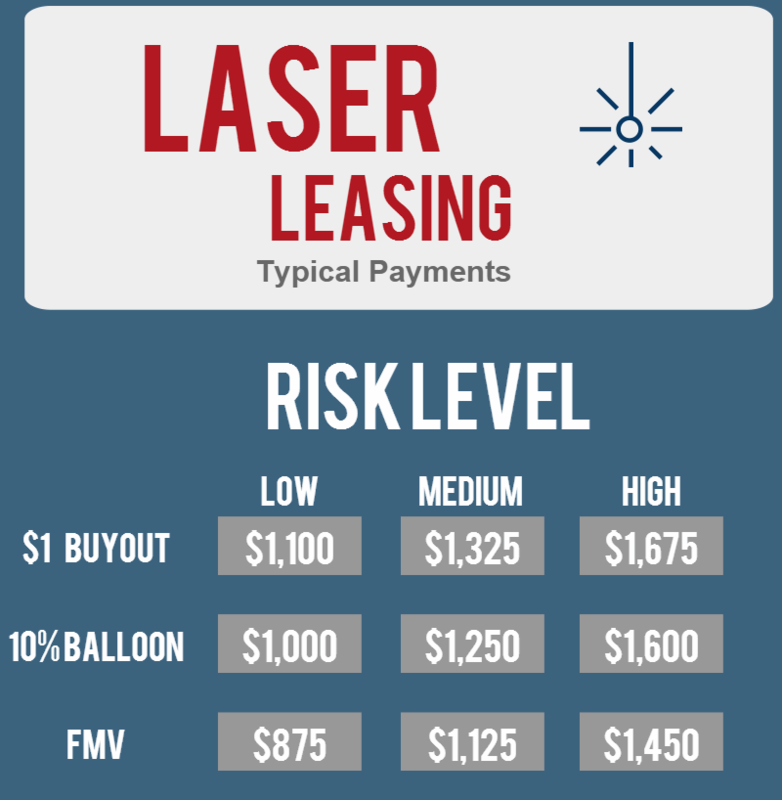 Consider a 5-year FMV lease at the higher risk level for a $50,000 laser. Let's also assume a 28% tax rate. As noted above, your approximate monthly payments would be $1,450. When you use an FMV contract, your accountant might mention that you may write off the entire payments. This means that after accounting for taxes your real payments are 28% cheaper, or just $1,044 on an after tax basis. It also means that you would save $24,360 in taxes over the life of the lease. On a $1 buyout, however, usually your only option is to depreciate the equipment. This means your tax write-off is capped at $50,000. In this case, choosing an FMV option would save you just over $10,000 in taxes over the other alternatives. Do you need help with medical or aesthetic laser financing? You may call us at (866) 631-9996 or click in the box below to get started.